Stay Smart at Our Great Davenport, FL HotelSituated just south of Orlando, our hotel's location is convenient to the area's best parks, restaurants and attractions, as well as many major businesses. Whether you're in town for business or pleasure, the Holiday Inn Express Hotel & Suites Orlando South - Davenport is a great place to relax, have fun and get the job done.Our hotel is near Disney World, making it an ideal place to stay when you want to spend time with friends and family at the Magic Kingdom. We're also near parks like Universal Studios, Florida and SeaWorld Orlando, amazing golf courses and attractions like Bok Tower Gardens and Fantasy of Flight. If you're into sports and nature, you'll enjoy the expansive Lake Myrtle Sports Complex and the beauty of natural areas like Shingle Creek Regional Park, both of which are near our Davenport, FL hotel.If you find yourself in town on business, our South Orlando hotel's a great option for an efficient and successful stay. Local companies include Ritchie Bros. Auctioneers and Del Webb, as well as Heart of Florida Regional Medical Center. 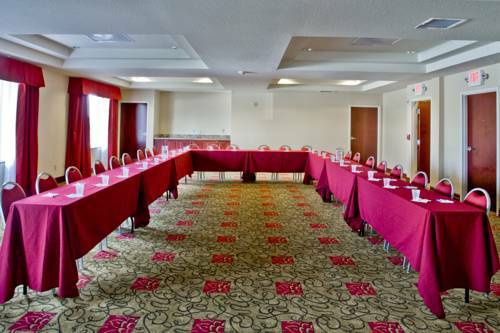 When you need to prepare a presentation, our 24-hour Business Center with a computer and printer is available for your use, as well as our great meeting room.No matter your reason for visiting Davenport, FL, our hotel is the perfect place to stay. Make reservations today to enjoy our outdoor pool, Fitness Center and complimentary, hot breakfast! Ridgewood LakesRidgewood Lakes Golf Course is located just 5 minutes south on US 27. Bok Tower GardensThe acres of ferns, palms, oaks and pines create a year-round backdrop of 1,000 shades of green for the seasonal bursts of azaleas, camellias and magnolia blooms that form an ever-changing work of art.